"Bees carrying pollen" is one of my favorite spectator sports these days. 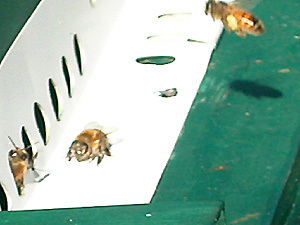 Even though they have a hard time steering, they really move fast once they get to the hive entrance, so photos are difficult. So I did my best. 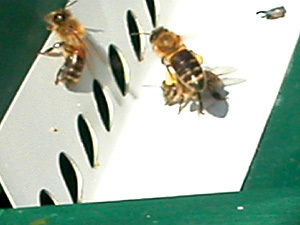 At left, the bee flying in has a pack of light yellow pollen on both of her rear legs. One of her sisters is looking at us from the entrance. I think the bee in front is in a bad way, though I thought she might be a guard. 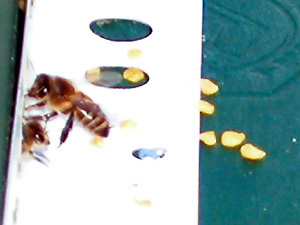 On the right, another worker carrying pollen has landed, and you can see the saddle bags from above. These pix come from Colony 1. Colony 2 is doing such business these days that pollen packs are getting knocked off at the door in the scramble to get in. This photo gives you some sense of the bee size to pollen load ratio. You can also see how nice and yellow the pollen is now. On the right, since there was space here, I thought I would show how the hive entrace size can be increased by sliding one end over (the far end is now open). I am hoping this helps Colony 1 a bit. 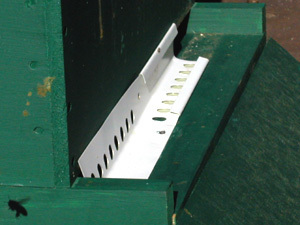 I have to watch that this does not open them up to molestation by pests or robbing from the bees next door.